SAN JUAN - Puerto Rico cannot repay its debts. The governor of the island, Alejandro García Padilla, declared this in a speech last Monday. The debt crisis in the Caribbean island did not attract as much attention as that of Greece, but observers have long been on 'America's own Greece. Puerto Rico is not a state of the US, but it is part of it. The Caribbean island has built up a debt of 73 billion dollars. The country has 3.6 million inhabitants, of whom approximately 45 percent live in poverty. 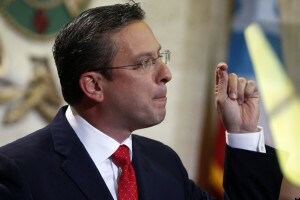 Two years ago Governor García Padilla swore that Puerto Rico could not go bankrupt, because it is a constitutional duty of the country to pay its lenders, but he did complain that the debt is unpayable. According to the Governor, he will have a plan before August 30 of this year for restructuring of the debt. He hopes for a long delay in payments. The special status of Puerto Rico does not make a solution to the debt problem any easier. The island is not an independent state and cannot request help from, for example, the IMF. But it is not a district or municipality of the US, so it cannot file for the bankruptcy protection, as Detroit did. Puerto Rico is an Associate Free State (Estado Libre Asociado). In 1917, Puerto Ricans were given the US citizenship. In 1952, the current relationship with the US was established in Washington called 'Commonwealth'. The island is part of the US, but the people do not vote in federal elections, and pay no federal taxes.